Now that the moon is past last quarter and therefore gone from the evening sky, look for one of summer’s most beautiful celestial sights. Be sure you are looking in a dark country sky, on a night when the moon is down. In a dark country sky, you will find a hazy pathway stretched across the sky during the late July evening hours. This band is the starlit trail of our own Milky Way galaxy. 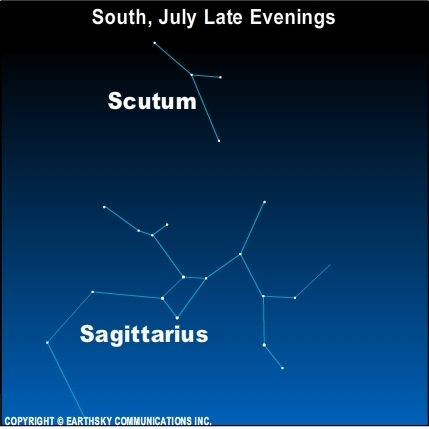 Looking southward late in the evening – toward the richest part of the Milky Way – you will find a very small constellation, called Scutum the Shield. It has only has four stars that make up the constellation outline. However, it is noticeable in a dark sky because the Milky Way is so rich here. The Shield is not big, but it provides some very nice views in dark skies with the unaided eye or binoculars. The very noticeable Teapot of Sagittarius is below Scutum. Scutum has a fascinating history. Astronomer Hevelius named it in 1683 for Jan III Sobieski. He was the Polish king that led his armies to victory in the Battle of Vienna. The constellation in charts of the era resembles the king’s coat of arms on his shield. Scutum is one of two constellations to be named after real people. Coma Berenices was named for an Egyptian queen.